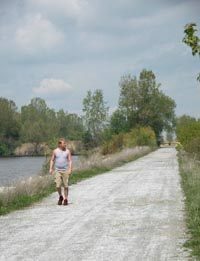 Middle Causeway is a dike that cuts across the heart of Pointe Mouillee and not only allows you to hike a shorter loop than following the perimeter dikes but leads you through the most interesting sections of the state game area. This is particularly true in April-May and September-October when the spring and fall migrations are taking place and the birdlife will be vibrant in the adjacent marshes and ponds. But arrive anytime during the summer and the waterfowl spotted will still be the highlight of this trek. A pair of compact binoculars add considerable to this outing even if you’re not a birder as well as a bird book if you’re interested what’s flying overhead. A walk of 7 miles may seem like a lot to some people but keep in mind that there is no elevation gain whatsoever and that the dikes are well marked and easy to follow. That and the fact the wetland scenery is so unusual makes this hike seem a lot shorter than it is. The loop can be walked in tennis shoes even though at times during the spring you can encounter mud along some dikes. On any clear day, a wide-brim hat and sunscreen are needed as little shade will be encountered anywhere along the loop. The trailhead is the Sigler Road parking area, reached from Jefferson Avenue by turning east on Sigler Road and driving pass the maintenance building. A yellow gate stops vehicles from continuing along the gravel road and is adjacent to a small parking lot. Step around the gate and Sigler Road takes on the appearance of a gravel two-track. To the north is the open water that is the mouth of the Huron River with the state game area headquarters visible. To the south is the marshy habitat of the Nelson Unit. 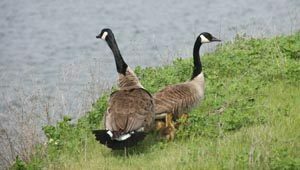 You see bird life on both sides and occasionally a family of Canada geese on the dikes themselves. At Mile 0.4 you arrive at a junction with another dike where a pumping station is located; head left to continue along the Huron River. A pull-over – a series of rollers that assists duck hunters with hauling their layout boats over the dikes – is encountered in a little over a mile from the start and at Mile 1.4 is the second junction. 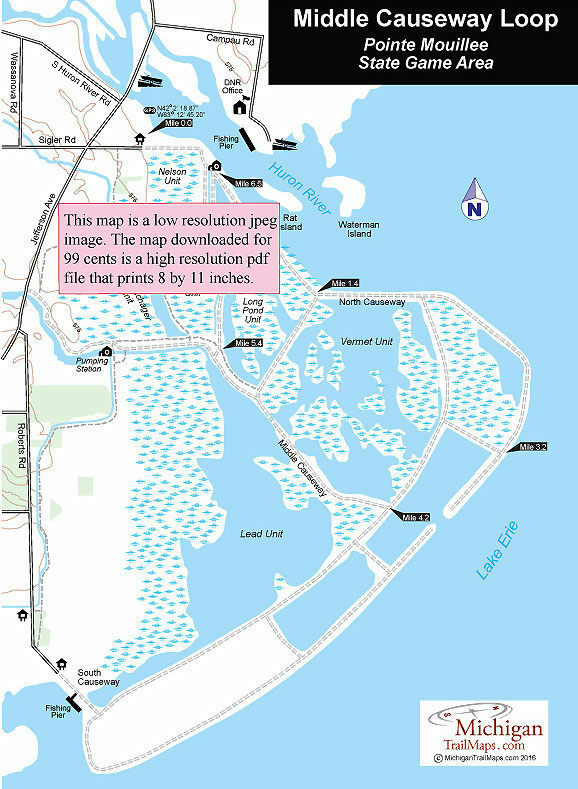 Head left to follow the North Causeway past the Vermet Unit, where the large patches of open water usually attract and hold large numbers of birds. At Mile 2 you arrive at junction on the edge of Wildlife Refuge section of the game area. This special area is the man-made barrier island that was the first step in restoring the wetlands. It is closed to hunters in the fall and is often referred to as the “banana” due to its elongated, curved shape. Head left again to hike along the outside of it and skirt Lake Erie. The view changes to a large expanse of a Great Lake to the east as you round the actual Pointe Mouillee while to the west are more cattail marshes humming with winged wildlife. At Mile 3.2 you head east (right) on the dike that heads inland for 0.3 mile before resuming a southerly direction (left) at the next junction. At this point all the dikes have been gravel two-tracks. At Mile 4.2 you arrive at the east end of the Middle Causeway that is posted with signs for Vermet Unit and Lead Unit. Head west (right) on the causeway to leave the Pointe Mouillee banana for good. It's a mile hike along the causeway with the open water of Vermet Unit north of you and the Lead Unit to the south. Depending on the time of the year, there could be birds all around, making this the most interesting stretch with the state game area. Eventually the Middle Causeway ends at the southeast corner of the Long Pond Unit where a pair of dike trails continues in a northwest direction to Bloody Run Unit. They parallel each other with a long narrow pond separating them. Follow either one and in 0.3 mile you arrive at a dike that forms the east side of Bloody Run Unit. This dike begins as a wide, dry trail but can be wet and muddy at times in the spring. After a spell you have an opportunity to head west (left) briefly to remain on the most distinguishable dike and at Mile 6.6 return to the pumping station you passed earlier. In the final 0.4 mile you backtrack to the parking area where your vehicle is located.